Marvel vs. Capcom 3: Fate of Two Worlds is a crossover fighting game developed by Capcom. It features Capcom's own characters and characters from American comic book company Marvel Comics. 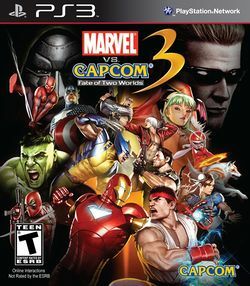 It is the fifth installment of the Marvel vs. Capcom franchise, the eighth installment in the Vs. series, the first to be exclusive to consoles, and the second in the Vs. series to use three-dimensional graphics on a two-dimensional battle area. The game is produced and directed by Ryota Niitsuma, who had previously worked on Tatsunoko vs. Capcom: Ultimate All-Stars, and features the same fast-paced, over-the-top fighting mechanics as earlier games in the series, along with new methods of play designed to make the game more accessible to new players. Marvel vs. Capcom 3 is a versus fighting game where up to two players compete in battle using characters with their own unique fighting styles and special attacks. The game features the same tag-based team feature as previous installments of the series, where each player chooses three characters that can be swapped at any point during a match, and utilizes the "Evolved Vs. Fighting System", a modified version of earlier systems seen in other Capcom Vs. titles. It is the first game in the franchise to feature three-dimensional character models as opposed to two-dimensional sprites, though gameplay remains restricted to two-dimensions, allowing characters to move only backward, forward, or straight up into the air. The game uses a control scheme modeled after Tatsunoko vs. Capcom: Ultimate All-Stars, which Capcom believes will "knock down the wall of complicated controls and open up the field of strategic fighting to all comers" as well as a new "Exchange" button used to launch opponents into the air, switch characters while performing a combo, and slam the opponent into the ground when used by certain characters. Players can use each button to string together combination attacks, as well as perform special moves using a combination of button presses and joystick movement. As characters attack, their Special Gauge fills with energy which can be expended by the player to execute powerful Hyper Combos and Team Combos that involve multiple characters.